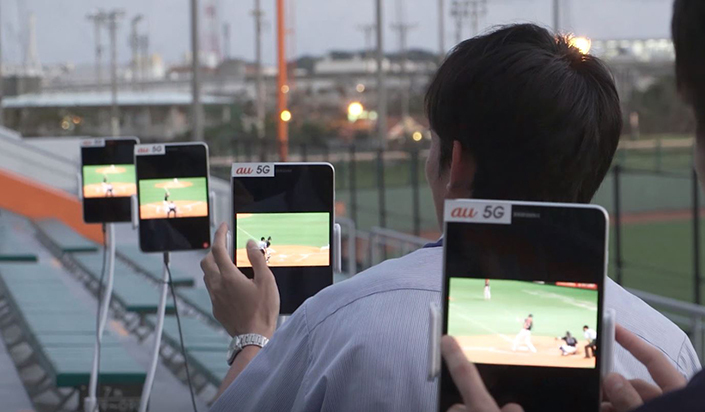 KDDI and Samsung Electronics today announced the successful completion of a 5G field trial held in Okinawa Cellular Stadium, a 30,000-person capacity baseball stadium in Japan. Using Samsung’s 5G end-to-end solutions spanning virtualized core, virtualized RAN, one of the smallest 5G access units, and multiple prototype 5G tablet devices, the trial showcased a live feed of 4K video contents downloaded and streamed simultaneously on 5G tablets supporting the millimeter wave spectrum. This is the first time to test 5G performance using 5G tablets in Japan. Samsung’s 5G access units with beam-forming technology were installed on a light tower located outside the left field fence to create 5G coverage in the direction of home plate and first and third bases. As a result, the tablets placed on seats in this coverage area were able to have 4K videos downloaded and streamed on them via 5G. The successful trial results reflect the two companies’ efforts in using 5G technology and ultra-high frequency spectrum (28GHz band in this instance), to redefine user experiences in crowded environments and spotlight a new approach to viewing sports games. The outcome of this 5G stadium trial connotes advanced connectivity, not only at sports events, but also in a wide variety of crowded entertainment spots, including live music concerts, exhibitions, and international conferences, leading to new viewing experiences. By demonstrating how users will be able to simultaneously access 5G networks and enjoy immersive experiences regardless of their location, today’s accomplishment continues 5G momentum as it enters commercialization stage. Since 2015, KDDI and Samsung have been working closely to demonstrate the performance of 5G in various real-life scenarios. This includes a multi-cell handover demonstration that took place in February 2017 where the device was mounted on a car that traveled the busy streets of Tokyo (Link), high-speed mobility test with the device attached on a car racing over 200km/hour (124 miles/hour) in Yongin, ‘Everland SPEEDWAY’ in Korea in September 2017 (Link) and the recent successful uplink/downlink handover test that took place on a high-speed train railway in Japan (Link). Samsung’s state-of-the-art technologies including the first commercial ASIC-based 5G modems and mmWave RFICs for compact access units, CPEs and tablets using in-house technology and assets laid down the framework for these demonstrations.